War is raging, tensions are high and the Lorca-led USS Discovery is on a fateful course to potentially turn the tide of the Federation/Klingon conflict. But is this story still holding steady? This week hosts Cam Smith and Tyler Orton tackle what could very well be the show's most polarizing episode yet! From the increasingly tragic tale of poor Ripper, to layered Klingon intrigue and a shocking early departure, the duo break down all the highs and lows making up this week's intense chapter of DSC drama. 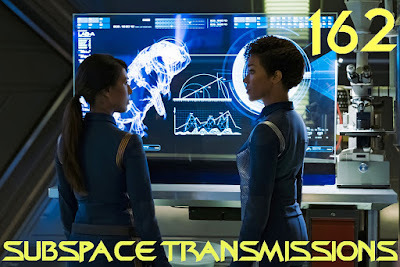 In addition to a thorough analysis of The Butcher's Knife Cares Not for the Lamb's Cry, your feedback is addressed, Blade Runner 2049 is reviewed and the groovy ship Ortonville transmits his thoughts on The Orville's Charlize Theron-tastic fifth episode, Pria. Wanna appear on the show? Shoot us a 30 to 60-second audio clip telling us your thoughts regarding THE BUTCHER'S KNIFE CARES NOT FOR THE LAMB'S CRY and you could take the spotlight in an upcoming program! You can also send any other questions, topic ideas or feedback to subspacetransmissionspod@gmail.com! Join us next week as we delve into Discovery's fifth episode Choose Your Pain!